IT Cosmetics CC Cream: Worth The Hype? | By Millie. You'll all be familiar with this one by now...either you've already tried it, or it's top of your list to pick up next. To say it's been hyped up would be an understatement. 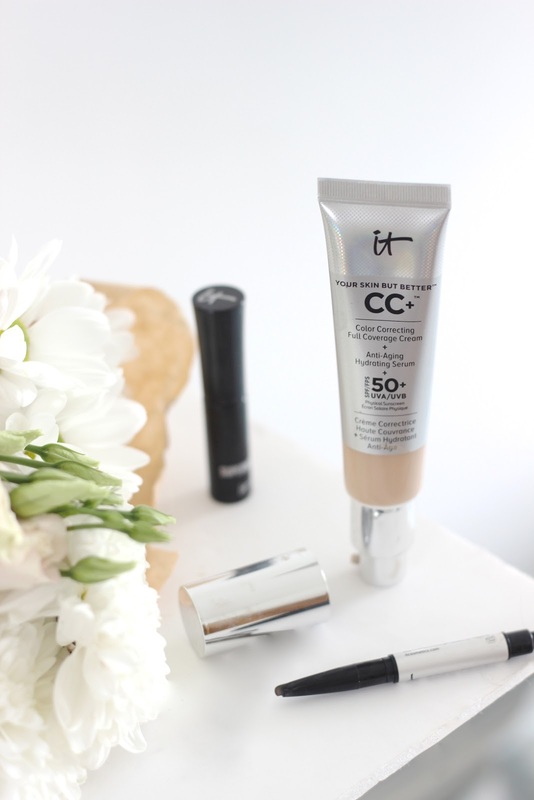 Once IT Cosmetics finally made its way across the pond I was very eager to try this well-loved CC cream out myself and see how I liked it. If I'm honest, none of their other products really screamed out to me, except their powder which I do want to try, so I left the Selfridges counter with just this and a couple of samples to try. As this brand is super new to the UK, don't be afraid to ask for some samples of their other products, the ladies are really nice and happy to do that to promote some of their other bits. IT Cosmetics CC Cream: A CC cream which offers full coverage really appealed to me. Normally these BB, CC, EE creams are more reminiscent of a tinted moisturiser than a foundation, so I'm happy they have broken away from that trend. At the end of the day CC means colour correcting, and what's more colour correcting than a full coverage base? There's a lot going on here, it's a CC cream, full coverage, SPF50+, anti-aging and a hydrating serum. Could they appeal to a wider audience? Behind all the faff lies a really nice, medium-full coverage, hydrating base. The reason why I would say this is medium-full coverage is because you really need to build this in order to get a completely full coverage finish. It definitely doesn't lack in pigment, but compared to some other foundations I have, it's not quite there. That's no draw-back, just something to bare in mind if you LOVE full coverage! I much prefer using this with a brush, as oppose to my beauty blender, I find it blends better and you get more coverage out of it. Normally I'm all about my beauty blender, but with this one I always reach for a dense stippling brush. To cover my whole face I use 1-2 pumps and the shade I have here (Light) is a great match for my skin tone. In total they have 7 shades available - I believe - which is pretty good for a CC cream. The finish is pretty skin-like I would say. It doesn't completely matte out your face, but it's not a dewy base either, somewhere in between, so I do powder afterwards to keep any unwanted shine at bay. I also found this stays on for a good 6 hours (I don't really wear my makeup for much longer to be honest) so I was pleasantly surprised. For everyday wear I have really been enjoying this, it's great that is has SPF50 too! At £30 I would definitely say give it a go as I feel it would be very universally pleasing. The packaging is really convenient, I love the pump, it's so easy to use and mess-free.